EXCEPT Kisatchie National Forest which has special regulations; consult the U.S. Forest Service for regulations. Caney, Corney, and Middlefork tracts of Kisatchie have the same regulations as Area 2, EXCEPT still hunting only for deer. Allen North of US 190 from parish line westward to Kinder, east of US 165 from Kinder northward to LA 10 at Oakdale, north of LA 10 from Oakdale, westward to the parish line. Avoyelles That portion west of I-49. Catahoula West of Boeuf River to Ouachita River, west of Ouachita River from its confluence with Boeuf River to LA 8, north and west of LA 8 southwesterly to parish line. Evangeline All EXCEPT the following portions: east of I-49 to junction of LA 29, east of LA 29 south of I-49 to Ville Platte, and north of US 167 east of Ville Platte. Grant All EXCEPT that portion south of LA 8 and east of US 165. Jefferson Davis North of US 190. LaSalle North of a line beginning where Little River enters Catahoula Lake, following the center of the lake eastward to Old River then to US 84, west of US 84 northward to LA 8, north of LA 8 eastward to parish line. Morehouse West of US 165 (from Arkansas state line) to Bonita, north and west of LA 140 to junction of LA 830-4 (Cooper Lake Road), west of LA 830-4 to Bastrop, west of LA 139 to junction of LA 593, west and south of LA 593 to Collinston, west of LA 138 to junction of LA 134 and north of LA 134 to Ouachita Parish line at Wham Brake. Ouachita All EXCEPT south of US 80 and east of Ouachita River, east of LA 139 from Sicard to junction of LA 134, south of LA 134 to Morehouse Parish line at Wham Brake. 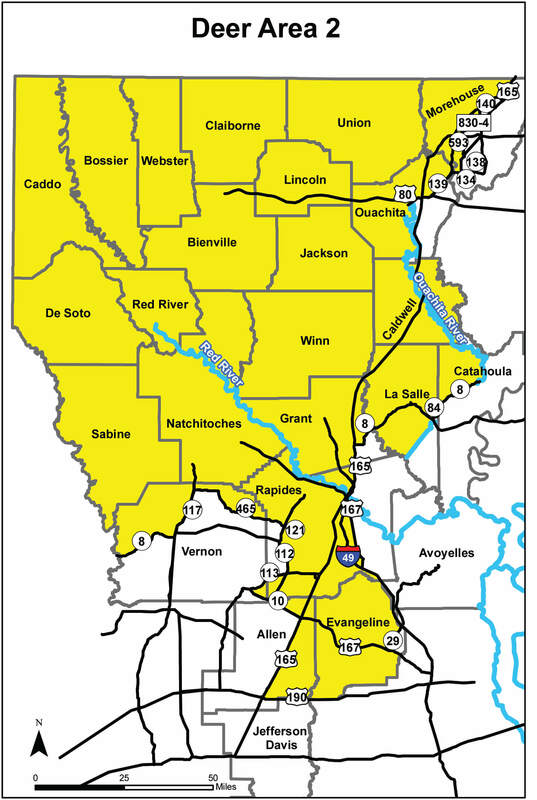 Rapides All EXCEPT north of Red River and east of US 165, south of LA 465 to junction of LA 121, west of LA 121 and LA 112 to Union Hill, and north of LA 113 from Union Hill to Vernon Parish line, and that portion south of Alexandria between Red River and US 167 to junction of US 167 with I-49 at Turkey Creek Exit, east of I-49 southward to parish line. Vernon North of LA 10 from the parish line westward to LA 113, south of LA 113 eastward to parish line. Also that portion north of LA 465, west of LA 117 from Kurthwood to Leesville, and north of LA 8 from Leesville to Texas state line. Claiborne & Webster Caney, Corney and Middlefork tracts of Kisatchie National Forest. (See Kisatchie National Forest Regulations). Ouachita East of Ouachita River. Rapides West of US 167 from Alexandria southward to I-49 at Turkey Creek Exit, west of I-49 southward to parish line, north of parish line westward to US 165, east of US 165 northward to US 167 at Alexandria. North of LA 465 from Vernon Parish line to LA 121, west of LA 121 to I-49, west of I-49 to LA 8, south and east of LA 8 to LA 118 (Mora Road), south and west of LA 118 to Natchitoches Parish line. Vernon East of Mora-Hutton Road from Natchitoches Parish line to Hillman Loop Road, south and east of Hillman Loop Road to Comrade Road, south of Comrade Road to LA 465, east and north of LA 465 to Rapides Parish line.